This crostini is a perfect, elegant bite to serve with a hearty glass of red wine. I purchased a super-thin filet so it was fairly inexpensive and also worked well with the bite-size crostini. You won't need all of the brie for this recipe, but you can also serve that on its own with crackers later. Set the brie out at room temperature to soften. Heat 2 tbsp. olive oil in a saute pan over medium high heat. Pat the steak dry with a paper towel and add it to the pan. Sear for 3 minutes on each side for medium rare (this was a super thin filet, a thicker cut will take longer). Remove from the pan and wrap tightly in tin foil. Meanwhile, whisk together balsamic vinegar and remaining 2 tbsp. olive oil in a bowl. Add the arugula and toss to coat. 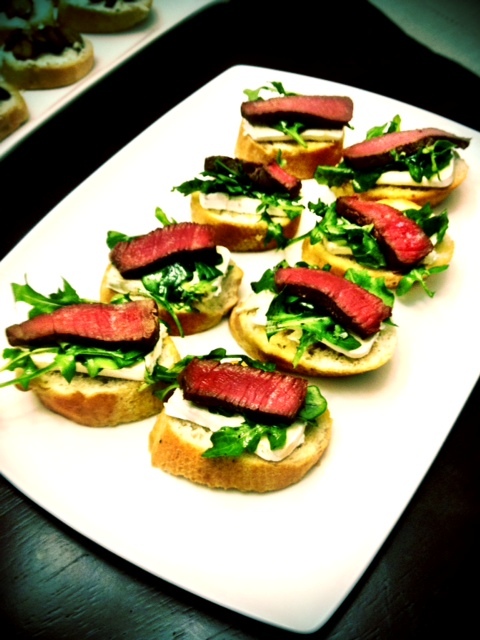 To assemble the crostini, top with a thin slice of brie, a bit of arugula (I roughly chopped it first), and a thin slice of filet. Sprinkle with salt and pepper and serve at room temperature.